Mark Tauger teaches history at West Virginia University. The journalist Anne Applebaum is a leading popular historian of the former European Communist countries. 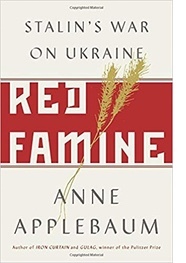 She has published a substantial study of the Soviet Gulag camp system that won a Pulitzer Prize, and a study of the Communist takeovers of Eastern Europe.1 In Red Famine Applebaum focuses on the great Soviet famine of the early 1930s, which she portrays as imposed artificially by the Stalin regime on Ukraine, and the result of a long history of alleged Russian and Soviet hostility toward Ukraine. This book has new information on Ukrainian culture in the 1920s, Ukrainian émigré historiography of the famine after World War II, the Ukrainian government’s use of famine history, and few other topics. Overall, however, it retells the nationalist story of the famine found in earlier publications, but inaccurately, and does not cite evidence in its sources that contradicts or undermines almost all its arguments. This review focuses only on certain indicative issues in the first part of the book, and then addresses the main problems with her depiction of the famine itself. This book relies almost entirely on published sources: monographs, articles, and archival document collections published in post-Soviet Ukraine or in Canada. In footnotes from the document collections, Applebaum consistently cites the full archival source, followed by the reference to the published source. A superficial reader might glance at these endnotes and think they were her own archival research. Applebaum criticizes scholars for “cherry picking” (49-50), and also falsely claims that one of my publications was not based on archival sources (419). Red Famine begins with a brief historical background, then has two to three chapters on each of the book’s main topics: the Civil War in Ukraine (1918-1921), the NEP in Ukraine (1921-1929), collectivization in Ukraine (1930-1931), events in 1932 that she considers the “preparation” of the famine including grain procurements, the “blacklisting” of villages and farms, restrictions on peasant movement, suppression of Ukrainian culture, the famine itself and its aftermath, the Soviet “cover-up” of the famine and later writings on it. This outline makes the book appear coherent and comprehensive. Yet every section has important omissions, errors and distortions. For example, she defines the Ukrainian word Holodomor, “a term derived from the Ukrainian words for hunger-holod-and extermination-mor.” (xxvi) But “mor” in Ukrainian means “plague”; the word for “extermination” is vynyshchennia [винищення].2 She begins her book on the “Holodomor” by mis-translating that term, attributing to it an intentionalist meaning it does not have. Applebaum also overemphasizes negative aspects of Russian-Ukrainian relations. She claims that the Ems Edict issued by Alexander II in 1876 “outlawed Ukrainian books and periodicals” and anticipated Soviet “sharp hostility” to Ukraine (8-9). Yet Alexander II’s government initially aided publication of Ukrainian books; the later restrictions on Ukrainian culture were a response to the Polish uprising of 1861 and were limited and weakly enforced.8 Ukrainian publishers published numerous publications in Ukrainian and about Ukraine, many of which are in western libraries, including catalogues of Ukrainian books available for purchase there.9 She discusses Bolshevik actions in Ukraine in 1919, the peasant rebellions of 1919-1921, the famine of 1921-1923 in Ukraine, and the successes of Ukrainization in culture, all of which have major problems, but for reasons of space I will focus on the 1933 famine and the events leading to it. In chapter 4, “The Double Crisis, 1927-1929,” Applebaum discusses the food crisis of 1928 and the harsh “extraordinary measures” that the Soviet regime applied to obtain food from peasants to feed townspeople, which have long been viewed as events that led to collectivization.10 Applebaum describes food shortages in Soviet cities in 1928 (82-83), but then writes that in Ukraine, “police discovered many tonnes [sic] of grain that had been kept back because peasants had, quite rationally, been waiting for prices to rise” (86). By calling peasants’ actions “rational,” Applebaum seems to endorse their withholding food for high prices, but her subsequent discussion is very critical of the Soviet government’s measures to induce peasants to stop hoarding and obtain food for starving townspeople. Yet many publications have argued that famines can be caused by farmers or traders withholding food from townspeople, sometimes expressed as the “moral economy,” the right to subsistence over the right to profit.11 Applebaum does not consider the possibility that hungry townspeople, and Soviet officials trying to feed them, could have interpreted these reports as a “man-made” famine created by profiteering peasants. Applebaum claims that the government’s procurements to alleviate that shortage “comprehensively destroyed the peasants incentives to produce more grain” (87). Yet later she writes that the 1930 harvest was much larger than the 1929 harvest (161). How could that have happened if peasants’ incentives were “comprehensively destroyed”? She also discusses Soviet famine relief effort in 1928-1929 (82, 108) but does not consider how crop failures and famine relief affected peasants’ incentives in this case. She shows that some Soviet leaders during this food crisis came to see Ukrainian nationalism as a threat, held show trials of Ukrainian nationalist groups, and began to connect peasant resistance problematically to nationalism. In this crisis that the Soviet regime decided to collectivize Soviet agriculture. Applebaum cites Stalin’s references to mechanized agriculture but dismisses them as a “Soviet cult of science” (87-89), not considering that Soviet leaders and planners were trying to emulate American farming, which was even more mechanized and scientifically based. She does not consider that repeated crop failures, which she mentioned, could have persuaded Soviet leaders that Soviet peasant farming needed to be modernized.12 Rather, she attributes the decision to collectivize agriculture to the 1928 Central Committee plenums that allegedly concluded that peasants had to be “squeezed” and “sacrificed” for industry (90-91). Yet modernizing agriculture was a central issue in those plenums. She never mentions that in 1929, the Soviets established VASKhNiL, the central agricultural research academy, under the leadership of the great biologist Nikolai Vavilov, who did not seek to “squeeze” the peasants. Applebaum’s discussion of collectivization and dekulakization in chapter 5 describes peasants as “abandoned and alone,” helpless, weak, with no incentive to resist (122). But in chapter 6 she describes them as angry, organizing armed bands, and extremely violent, slaughtering their livestock, rebelling against and murdering Soviet officials, without addressing the contradiction. She admits that in the archival documents of the 1930 rebellions, “it is not always easy to separate fact from fiction” and describes them as often “deliberately embroidered” and “exaggerated and hysterical” (152-153). Yet she never questions them based on this point. Applebaum’s discussion of the collective farm system (chapters 6 and 7) has many inaccurate and problematic passages. For example, she claims that after collectivization, peasants had no way to earn a “salary” (137), but she notes a few pages later that kolkhoz peasants had private plots and livestock, from which they earned money through the whole Soviet period (147). Peasants before collectivization did not earn “salaries” or wages but were “paid” by the harvest they produced, which depended in part on their work, so payment by labor days after the harvest was basically similar. She claims that in the kolkhozy the “fruits of the peasants’ labor no longer belonged to them, the grain they sowed and harvested was requisitioned by the authorities,” but this would at least require evidence of harvests and procurements, which she never clearly presents (see below). She asserts that kolkhoz peasants “lost the ability to make decisions about their lives,” and that kolkhoz peasants had to follow local authorities’ directions for the crops they grew. Yet on the one hand, she never explains that for decades before 1930, peasants were obliged by the village to farm the same crops at the same times in the same fields in dozens of strips scattered over the village, which means that collectivization retained village dominance over farming. On the other hand, she claims that peasants “worked as little as possible” (159-160), and that 40,000 peasant households decided they “would not plant anything” in April 1932 (171), which were clearly their own decisions. Applebaum also claims that in kolkhozy as in socialist industry, since there was no “private property,” peasants like workers engaged in pervasive theft (160, 165). Yet American businesses lose tens of billions of dollars every year to workplace theft.13 She ignores the fact, which she notes later, that the kolkhoz-sovkhoz system recovered from the famine and that food production increased. This could not have happened if the peasants did no work and stole everything. Applebaum’s discussion of the grain procurements is similarly inconsistent and incomplete. She refers to the “unrealistic, impossible procurement plan of 5.8 million tons” for 1932, (179) yet earlier she wrote that the 1931 plan was 8.3 million tons (168), and she never compares the two or explains why the lower 1932 plan was “impossible” while the higher 1931 plan was not.19 She also does not explain that this 1932 plan was reduced from the original 1932 procurement plan of 7.1 million tons.20 The regime announced the reduced procurement plan for 1932 in a long decree published on 6 May that granted peasants and kolkhozy the right to sell their produce on the free market after fulfilling procurement quotas.21 This was a crucial decision in Soviet history because it laid the basis for the kolkhoz private-plot economy that played a major role in food production to the end of the Soviet regime. Yet she calls it an “an edict” that “forbid peasants from trading” until meeting procurement quotas (195), completely omitting its reduction of those quotas, including Ukraine’s from 7.12 million tons to 5.83 million tons, or almost 20 percent. She does not even footnote or give any other reference to this document, which was in her sources. (2) Applebaum describes the blacklisting policy, which denied a kolkhoz or village access to trade, forced them to pay debts early, and sometimes seized other possessions, as a main cause of the famine. Yet her own sources show that in December, at the peak of the campaign, only some 400 kolkhozy were blacklisted, out of 23,270 kolkhozy in Ukraine.27 Her sources agree that blacklisting could not and did not stop trade.28 The Ukrainian government also removed villages from the blacklist if they met most of the procurement quota.29 Applebaum never mentions these points. Based on this evidence, it is difficult to accept Applebaum’s claims that blacklisting was a major cause of famine mortality. (4) In chapter 10 Applebaum describes the harsh searches that local personnel, often Ukrainian, imposed on villages, based on a Ukrainian memoir collection (222), and she presents many vivid anecdotes. Still she never explains how many people these actions affected. She cites a Ukrainian decree from November 1932 calling for 1100 brigades to be formed (229). If each of these 1100 brigades searched 100 households, and a peasant household had five people, then they took food from 550,000 people, out of 20 million, or about 2-3 percent. As will be discussed below, even if all of these people died from the confiscatory searches, this would be only a small share of the total famine deaths. (5) Applebaum’s attribution of the famine to a “vicious propaganda campaign” against peasants accused of withholding grain leaves out half the story. She cites several sources in which officials and other people expressed certainty that peasants were withholding food (231ff). Yet she does not connect these sources to the published reports from 1928 she cited earlier of peasants withholding grain, which some people must have remembered. Yet the propaganda was not the whole story. She cites Stalin’s famous letter to Sholokhov blaming peasants for shortages, but does not mention that he sent food relief to Sholokhov’s region.33 Her sources have many documents that viewed peasants as victims, allotted relief to starving villages and to children and invalids in hospitals, and even reporting arrests of personnel for poor work in aiding starving people.34 She wrote about some of these relief efforts (269ff), but does not consider whether these actions undermined the “propaganda campaign” of hostility to peasants. Applebaum’s second summary conclusion concern Ukrainian nationalism. She argues that “the famine was a political famine, created for the express purpose of weakening peasant resistance, and thus national identity, and in this it succeeded” (283). Yet she provides only anecdotal evidence of “peasant resistance” and never explains how it was related to “national identity.” Her main evidence for this consists of stories fabricated by officials about peasant conspiracies and connections with Ukrainian nationalists abroad (e.g., 95ff, 102ff, 184). If “resistance” meant peasants holding back produce for higher prices, it is difficult to see this as “nationalist,” because it caused people in Ukrainian cities to starve, and because Russian peasants were accused of this as well. Later, in discussing Nazi genocide in Ukraine, she makes an even stronger claim (323): “This was Stalin’s policy, multiplied many times: the elimination of whole nations through starvation.” But 24 pages later (347) she writes: “Stalin did not seek to kill all Ukrainians ….” She never addresses this contradiction and never documents either claim. She argues the famine brought “the end of Ukrainization.” She writes the arrests of “almost 200,000” Ukrainian political and cultural figures, which she calls an “entire generation of educated patriotic Ukrainians” (217), although she never explains what happened to them. While the arrests she describes certainly harmed Ukrainian culture, Ukraine had 8-9 million townspeople, and many more than 200,000 were educated.42 She claims that, as a result of this repression, “Russian language returned to dominance” (218), but her examples are Donetsk and Odessa, highly Russian regions. Ukrainian statistics show that the share of district newspapers in Ukrainian decreased from 85.3 to 80 percent. But 80 percent is still dominant, and greater than the percentage of Ukrainians in Ukraine in the 1937 census.43 The number of books published in Ukrainian in Ukraine increased from 27 million in 1928 to over 55 million in 1934 and 65.3 million in 1937, almost 90 percent of all books published, with only 5.8 million in Russian.44 In 1935-1936, out of 4.96 million students in schools in Ukraine, 4.1 million were taught Ukrainian, 634,962 Russian, and much smaller numbers for 17 other languages.45 In light of these data, it is difficult to accept her claim that Ukrainization ended. In chapter 14 Applebaum discusses the Soviet attempt to conceal the famine and reports by foreign visitors to inform the outside world about it. They included journalists, and she contrasts the writings of Gareth Jones, who traveled in Ukraine briefly and wrote about the famine, with those of Walter Duranty, who she claims concealed the famine. Yet she does not cite Duranty’s article on the front page of the New York Timeson 24 August 1933, with the headline “Famine Toll Heavy in Southern Russia,” with the subheading, “Death Rate During Last Year Has Trebled – Food Supply Now Held Assured,” and the first paragraph, which reads, in part: “The food shortage which has affected almost the whole population in the last year, and particularly the grain-producing provinces – that is, the Ukraine, North Caucasus, the Lower Volga region – has, however, caused heavy loss of life.” Duranty did not “deny” the famine. Applebaum’s chapter 15 on “The Holodomor in History and Memory” surveys the nationalist historiography of the famine, from publications during the Nazi occupation of Ukraine, to émigré publications mainly in Canada, culminating in Robert Conquest’s 1986 book Harvest of Sorrow, and writings on the famine in independent Ukraine. This historiography is informative, but she criticizes “Soviet scholars and mainstream academic journals” for allegedly ignoring Ukraine. She describes as “unprecedented at the time for a book about Ukraine” (337) that academics reviewed Harvest of Sorrow. Yet a search in JSTOR for reviews in 18 Slavic studies periodicals during 1960-1985, the 25 years before the publication of Harvest of Sorrow, using the keyword “Ukraine” brought up over 800 reviews, and using the keyword “Ukrainian” over 1100 reviews. Red Famine does present recently published anecdotal evidence about many aspects of the famine, but most of Applebaum’s extreme statements are undocumented. Her portrayal of Ukrainians as victims of persecution is exaggerated for the Tsarist period and misleading for the Soviet period: the regime arrested many Ukrainian cultural figures, but they arrested many Russian cultural figures as well, and Ukrainization as evidenced in publishing and education did not end. Her arguments attributing the 1932-1933 famine to blacklisting, roadblocks, searches, and propaganda are contradicted by evidence in her own sources that she does not cite. Her claim that the famine did not result from a crop failure is contradicted by her own statements, and by evidence in her sources that she does not cite, especially the large reduction in food procurements from Ukraine. Since the famine after the low procurements in 1932 was much worse than the one after the higher procurements in 1931, the only rational explanation is that the 1932 harvest was also much smaller.46 Applebaum’s discussion of the debate over whether the famine was genocide (347ff) ignores these issues, which are crucial for that discussion. While this review article does not allow for a full discussion of the issue of genocide and Stalin’s responsibility, we can at least note certain conclusions from the sources presented here. Stalin and other leaders made concessions to Ukraine in procurements and were clearly trying to balance the subsistence needs of Ukraine and other regions, especially people in towns and industrial sites who could not access the surrogate foods that some peasants relied on to survive (see for example Applebaum ch.12). Soviet leaders did not understand the 1932 crop failure: they thought that peasants were withholding food to drive up prices on the private market, as some of them had in 1928. They worried about the Japanese take-over of Manchuria in 1931-1932 and the Nazi victory in Germany in early 1933, and feared nationalist groups in Poland and Austria could inspire a nationalist rebellion in Ukraine. Faced with these “threats,” Soviet leaders were reluctant to make the USSR appear weak by admitting the famine and importing a lot of food, both of which they had done repeatedly earlier. The famine and the Soviets’ insufficient relief can be attributed to crop failure, and to leaders’ incompetence and paranoia regarding foreign threats and peasant speculators: a retaliatory version of the moral economy. I hope that this review will help readers and scholars to be cautious in referring to Red Famine and to be alert to the problems in this kind of writing. 1Gulag: A History, Doubleday, 2003; Iron Curtain: The Crushing of Eastern Europe, 1944-1956, Doubleday, 2012. Her website that lists many of her writings is:https://www.anneapplebaum.com/. 2See for example, M. L. Podves’ko, Ukrains’ko-Anhliys’kyy slovnik, Kyiv, 1957, pp. 106, 445; W. Niniows’kyi, Ukrainian-English and English-Ukrainian Dictionary, Edmonton, 1985, pp. 343, 488. The Google translator also gives these translations. 3Ukraine’s rural population was approximately 24 million, Russia’s was 76 million, in 1926; Vsesoiuznyi perepis’ naseleniia 1937g. Kratkie itogi, Moscow, 1991, 48-51. Russia’s rural population was 83% of the total population, Ukraine’s rural population was 81.7% (my calculation from this source). She discusses the 1937 census (299ff), yet does not notice that it also shows the same population relationship: Vsesoiuznyi perepis’ naseleniia 1937g., 51. 4V. I. Gurko, Features and Figures of the Past, Stanford: Stanford University Pres, 1939, 136. 5Graham Tan, “Transformation versus Tradition: Agrarian Policy and Government-Peasant Relations in Right-Bank Ukraine 1920-1923,”Europe-Asia Studies, v. 52 n. 5, July, 2000, 918ff. Her source was V. M. Lytvyn et al., Istoriia ukrains’koho selianstva, Kiev, 2006, v. 2, 59. 6T.K. Dennison, A.W. Carus, “The Invention of the Russian Rural Commune: Haxthausen and the Evidence,” The Historical Journal, v. 46 n.3, September 2003, 561-582; M. M. Gromyko, Mir russkoi derevnyi, Moscow, 1991, 57ff. ; P. N. Zyrianov, Krest’ianskaia obshchina evropeistkoi Rossii, Moscow: Nauka, 1992, 50ff. 7Zyrianov, Krest’ianskaia obshchina , 36, shows repartitional communes dominant in most Ukrainian provinces; on household tenure, Vadim Koukouchkine, From peasants to labourers: Ukrainian and Belarusan immigration from the Russian Empire to Canada, Montreal: McGill-Queens University Press, 2007, 17-18; David Moon, The Russian Peasantry, 1600-1930, London: Longman, 1999, 93. 8The best study of this issue is Alexei Miller, The Ukrainian Question: The Russian Empire and Nationalism in the Nineteenth Century, Budapest: CEU Press, 2003; on these points: 62ff, 97-115, 230-241, 267ff. 9Kataloh knyzhnaho magazyna redaktsiy zhurnala “Kievskaia staryna,”28 pages, 1899, and Katalog malorusskikh khig knizhnago magazine Stepana Ivanovicha Gomolinskago, 32 pages, 1887, which is available online: https://cdm16014.contentdm.oclc.org/digital/collection/p4014coll9/id/21391/rec/1. 10See, for example, Moshe Lewin, Russian Peasants and Soviet Power(New York: Norton, 1968), and Michael Reiman, The Birth of Stalinism(Bloomington: Indiana University Press, 1987), among many other publications. 11See for example Pierre Spitz, “The Right to Food in Historical Perspective,” Food Policy, v. 10 n. 4, November 1985, 306-316, and especially E. P. Thompson, “The Moral Economy of the English Crowd in the Eighteenth Century,” Past & Present, n. 50, February 1971, 76-136. .
12These are discussed in Tauger, “Stalin, Soviet Agriculture, and Collectivization,” in Trentmann and Just, eds., Food and Conflict in Europe in the Age of the Two World Wars, New York, 2006, and “La famine soviétique ‘inconnue’ de 1924-1925,” in Tauger, Famine et transformation agricole in URSS, Paris: Delga, 2017, 27-74. 13See the study inhttps://www.cnbc.com/2017/09/12/workplace-crime-costs-us-businesses-50-billion-a-year.html?__source=sharebar%7Cemail&par=sharebar, and Edwin H. Sutherland, White Collar Crime: The Uncut Version, Yale University Press, 1983. On Russia, see for example Christine Worobec, “Horse Thieves and Peasant Justice in Post-Emancipation Imperial Russia,” Journal of Social History, v. 21 no 2, Winter 1987, 281-293. 14See Tauger, Natural Disaster and Human Action in the Soviet Famine of 1931-1933, Pittsburgh, 2001; Davies and Wheatcroft,Years of Hunger, passim; Stalin, Sochinenniia, Moscow, 1954, v. 13, 216-217. 15Ruslan Pyrih, ed., Holodomor1932-1933 rokiv v Ukraini: dokumenty I materialy, Kyiv,2007, 63-64. 16Holodomor, 2007, 156; Holod na Ukraine, Ochyma istorikov, movoiu dokumentiv, Kyiv, 1990, 162. 17Davies and Wheatcroft, Years of Hunger, Palgrave MacMillan, 2004, 449. 18On these points see Tauger, "The 1932 Harvest and the Famine of 1933." Slavic Review, v. 50 no. 1, Spring 1991, 70-89; and idem., Statistical Falsification in the Soviet Union: A Comparative Case Study of Projections, Biases, and Trust, The Donald W. Treadgold Papers in Russian, East European, and Central Asian Studies (Seattle: University of Washington, 2001), no. 34. 19Her sources indicate that the 1931 procurement plan for Ukraine was actually 7.17 million tons; Holodomor, 2007, 173. 20Holod … ochyma, 1990, 352-353; Holodomor, 2007, 642. 22Holodomor, 2007, 290-303, 355-360, 597-601. 24Holodomor, 2007, 641; Holod … ochyma, 1990, 349. 26Davies, Wheatcroft, Years of Hunger, 470. 27Heorhii Papakin, “Blacklists as an instrument of the Famine-Genocide of 1932-1933 in Ukraine,” translated from Ukrainian and available at: https://holodomor.ca/academic-articles/ , pp. 8-10. Holodomor, 2007, 458, 620; Holod 1932-1933 ochyma, 1990, 311-314; on number of kolkhozy, Asatkin, Narodne hospodarstvo USRR, 1935, 205. 28Holodomor, 2007, 458, 620; Holod 1932-1933 ochyma, 1990, 311-314; the regime had brought goods to villages for years to trade for grain. 29Papakin, “Blacklists,” note that some villages were placed on and off the blacklists multiple times, which implies that the policy was arbitrary rather than systematic. 30Tragediia Sovetskoi derevni, v. 3, 634, 644. 31N. A. Ivnitskii, Golod 1932-1933 godov v SSSR, 2009, 199. 32RTsKhIDNI, f. 112, op. 26, d. 21, l.229. I discussed this source in detail in “Soviet Peasants and Collectivization, 1930-1939: Resistance and Adaptation,” in Steven Wegren, ed., Rural Adaptation in Russia, Routledge, 2005, 83ff. See Ivnitskii,Golod 1932-1933 godov v SSSR. 34Holod 1932-1933… ochyma, 1990, 455-456. 35See John Whitman, “The Kolkhoz Market,” Soviet Studies, v. 7 (April 1956), 390. 36Holodomor, 2007, 641; Holod … ochyma, 1990, 349, as noted above. For an example of relief that began on & February, two days after the suspension of procurements, see Holodomor, 2007, 663; Holod … ochyma, 1990, 374. The fact that both collections include this document means that the editors considered it significant. 37For example, Davies, Wheatcroft, Years of Hunger, ch. 6. 39See Tauger, Commune to Kolkhoz, PhD dissertation, UCLA, 1991, ch. 7, and Davies and Wheatcroft, Years of Hunger, passim, among other sources. 40France Meslé, Jasques Vallin, Evgeny Andreev, “Demographic Consequences of the Great Famine: Then and Now,” in Graziosi et al., After the Holodomor, Cambridge: HURI, 2013, 220-222. 41Holodomor, 2007, 771, 775-778; Holod … Ochyma, 1990, 399-400. 42Vsesoiuznaia perepis’ naseleniia 1937 g. Kratkie itogi, Moscow, 1991, 28.58. 43Vsesoiuznaia perepis’ naseleniia 1937 g., 94: Ukraine had 28.4 million people of whom 22.2 million or 78 percent, were Ukrainian. 44Narodne hospodarstvo USRR: statystychnyi dovidnik, ed. O. M. Asatkin, Kyiv, 1935, 575, 577, Vsesoiuznaia perepis’ naseleniia 1937 g., 94; Kniga i knizhnoe delo v Ukrainskoi SSR, Kiev, 1985, 399. 45Sotsialistychna Ukraina: Statystychnyy zbirnik, Kyiv, 1937, 222. 49Graziosi, ed., After the Holodomor, Cambridge: HURI, 2013. For this and other issues, see my review of this book inNationalities Papers, v. 43 n. 3, 2015, 514-518. 50Peter Kenez, The Birth of the Propaganda State: Soviet Methods of Mass Mobilization, 1917-1929, Cambridge, 1985, 2, 4, 7. 51Peter Charles Hoffer, Past Imperfect. Facts, Fictions, Fraud: American History from Bancroft toAmbrose, Bellesiles, Ellis, and Goodwin, New York, 2004, 139.